Filmmaker Adams Wood in person to introduce the film! Both humorous and scathing, Boom delves into the ironies and contradictions of the “New Economy” that ushered in the first dot-com boom during late ‘90s in San Francisco. Focusing on the housing crunch, which displaced record numbers of working-class families, nonprofits, and artists; Boom delivers an ambitious social critique while telling stories of individuals displaced by a rapidly changing city. With perspectives from all sides of the issue, Boom! captures San Francisco at the peak of that momentous time. Featured are interviews with dot-com workers, real estate developers, and San Francisco Mayor Willie Brown, as well as those who challenged the new economic order through community organizing, electoral politics, and direct action. 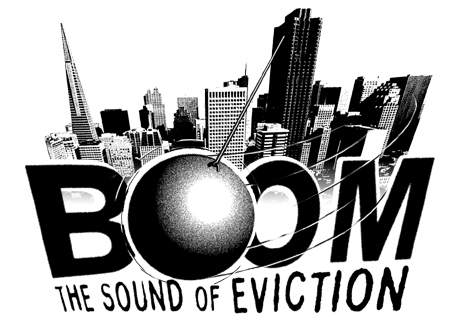 This documentary is just as relevant in 2014 as San Francisco faces another upheaval of gentrification during the second dot-com boom – evictions are up, rents are outrageous, and people are being forced to leave the area. There are lessons to be learned from San Francisco as Asheville undergoes its own wave of change due to an economic boom. Driven by different factors, these waves of gentrification could result in similar outcomes – a city unrecognizable to its working class and long-time residents. How does a city keeps its character and remain an affordable place for everyone, not just the affluent? We hope this screening will fuel some dialog around these complicated issues. FRANCINE CAVANAUGH and ADAMS WOOD are a husband-and-wife filmmaking team who moved to Asheville, NC from the San Francisco Bay Area in 2002. Their film ON COAL RIVER (2010), premiered at AFI/Silverdocs, screened at festivals around the world and won awards including Best Documentary at the Appalachian Film Festival, and an IFP/Gotham Award nomination. Adams began making documentaries in the Idaho wilderness in 1996, and Francine found her way to film through theater and dance in 1999. They are currently working on their third feature.